Update: the USGS discovered Wednesday that the slide set off a 2.8 magnitude earthquake at 11:43 pm Sunday. Additionally, the U.S. Forest Service reports that there were no logging activities in the area where the mudslide occurred. It looked like lava and sounded like a freight train. That’s how locals described the sea of mud and debris that flowed down the green foothills of western Colorado’s Grand Mesa on Sunday afternoon, carving a path of destruction 3 miles long and a half-mile wide. Three men missing from nearby Collbran are presumed dead; rescue efforts have been halted by mud that’s up to 250 feet deep; and though the slide occurred in a rural area away from most homes, it came within 25 feet of a natural gas drilling pad with three active wells. “It’s an understatement to say it’s massive,” Mesa County Sheriff Stan Hilkey said in a press conference on Monday. For comparison, the mudslide that captured national attention and killed 43 people in Oso, Washington, in March covered one square mile. The Mesa County slide was eight times that size, and the biggest difference appears to have been luck: unlike in Oso, residents of Collbran simply hadn’t built homes in the path of natural disaster. The county’s oil and gas wells, however, are a different story. Though the mud just barely missed a drill pad operated by Occidental Petroleum Corporation, 16 additional wells sit below the current slide, and Mesa County isn’t in the clear just yet. Temperatures are expected to reach 85 degrees Wednesday afternoon, kicking snowmelt into high gear and increasing the risk of another slide. “There’s an unofficial consensus that an additional slide is likely,” says David Ludlam, executive director of the West Slope Colorado Oil and Gas Association, an industry trade group. Lynn Highland, a geographer with the U.S. Geological Survey’s National Landslide Information Center, agrees that a second slide is a real possibility. She also underscores what High Country News contributing editor Judith Lewis-Mernit recently pointed out: There’s no database of the thousands of precarious hillsides looming over homes and infrastructure in the West. The last national map of landslide risk was released in 1982, and as climate change increases the frequency of the freak rainfall and rapid snowmelt that lead to giant mudslides, the map has grown obsolete, Highland says. Plus, despite landslides’ equal capacity for destruction, people don’t give them as much thought as, say, earthquakes. 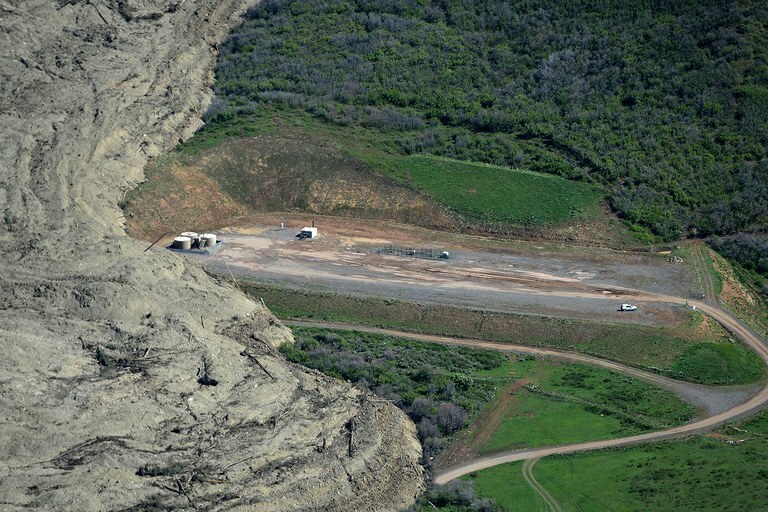 The 2012 budget of the USGS’ landslide center was $3.2 million, compared to the $55 million allocated to its Earthquake Hazards Program. “The philosophy is to let the locals take care of landslide issues, and some are just better at it than others,” Highland says. “In a way, it’s based on how much money they have to spend.” California, for example, is among the best states for identifying and mapping hazards, partially in response to disasters like 2005’s La Conchita landslide, which killed 10. But very few states can really be described as well-prepared; Colorado falls somewhere in the middle. All in all, Mesa County dodged a bullet: The human and environmental cost of the mudslide could have been much worse. But the situation leaves one wondering what would have happened if the slide had occurred just a mile to the north or west, potentially burying homes or rupturing oil and gas storage tanks. Most drilling equipment doesn’t shut off automatically if it’s compromised: A slide would affect pressure and other factors being monitored electronically, but a worker then has to manually shut the equipment down. Given the suddenness of the recent mudslide, there seems ample room for human error ­– or at least a slight lag – in future natural disasters. Krista Langlois is an editorial fellow at High Country News. She tweets @KristaLanglois2. Video of Collbran mudslide aftermath courtesy EcoFlight/Dom Smith.